Israeli Prime Minister Benjamin Netanyahu accused Iran of having a "secret atomic warehouse" in Tehran for its illicit nuclear weapons program during a speech to the United Nations General Assembly on Thursday. Netanyahu castigated what he called "inaction" by the International Atomic Energy Agency, the U.N.'s atomic watchdog, in the face of Israeli intelligence about Iranian clandestine nuclear work, adding that he would reveal a new finding to the world by Israel in its battle to keep Iran's nuclear ambitions at bay. "Today, and disclosing for the first time, that Iran has another secret facility in Tehran, a secret atomic warehouse for storing massive amounts of equipment and material from Iran's secret nuclear weapons program," he said. 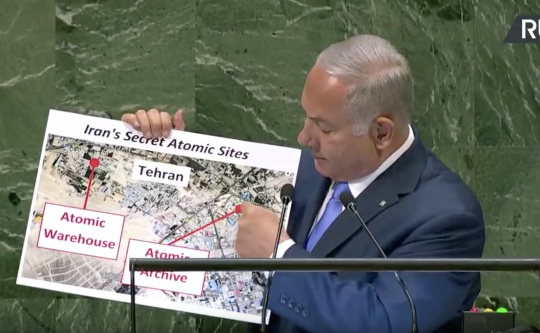 Netanyahu, who often uses visual aides, held up a photo of what he said appeared to be an "innocent-looking compound." Verification of Israel's claim could show that Iran is in material breach of the Iran nuclear deal, the Telegraph reported. Mr. Netanyahu said Iran had recently moved 15kg of radioactive material from the warehouse and "spread it around Tehran in an effort to hide the evidence." He claimed the warehouse at one point may have held up to 300 tonnes of material and equipment. There was no immediate response from Iran to Mr Netanyahu's accusations. The International Atomic Energy Agency (IAEA) and European countries have consistently said Iran is abiding by the terms of the nuclear deal. Iranian officials, Netanyahu said, have begun cleaning out the warehouses, but added there are at least 15 "gigantic" ship containers "full of nuclear-related equipment and materials stored there." "Do the right thing. Go and inspect; go and investigate," he said. "The reason Iran did not destroy its atomic facility and warehouse is because it is not finished with them." Netanyahu, who has used the U.N. platform for years to warn member countries of the threats that Iran pose to Israel and the rest of the world, opened his remarks by talking about the Jewish state's longstanding opposition to the Iran nuclear deal. The deal was negotiated by the "P-5+1" countries—China, France, Russia, the United Kingdom, and the United States, plus Germany—and Iran. Netanyahu argued that the agreement "paved" Iran's path to a nuclear weapon. He has often noted how some of the deal's key restrictions on Iran's nuclear program expire in about a decade, and how the accord does not address the Iranian regime's support for terrorism and other non-nuclear activities. This entry was posted in National Security and tagged Benjamin Netanyahu, Iran Nuclear Deal, Israel, Nuclear Iran, United Nations. Bookmark the permalink.